This room is an exemplary instance of how colours can play a significant role in creating the perfect mood and ambience in your room while lending to it a distinctive character. This living room sticks to a normal pastel and cream colour theme, with the fiery orange adding a lively touch to this otherwise drab colour scheme. The wall behind the television and speaker set has been laminated with acrylic orange panels that are further illuminated by overhead yellow lighting. The orange cushions offset this effect brilliantly, upon the pale and brown sofa sets. The floors are once again a polished wood marble design, overlain with finely woven carpets. 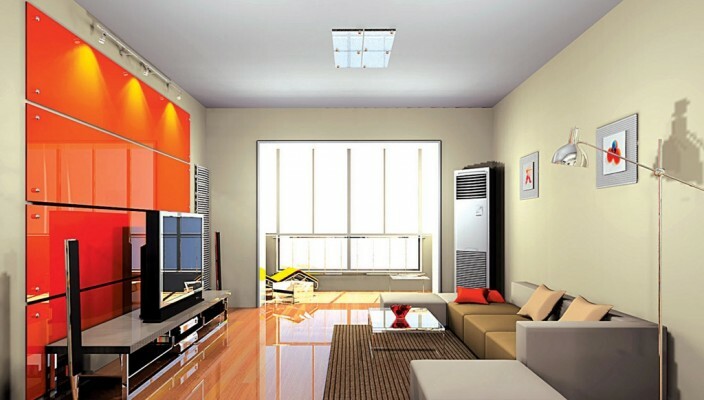 An air conditioner sits at one corner of this well furnished room, while a tall steel lamp graces another. The overhead lighting is a plain luminescence that adds to the understated beauty of this living room.